Where every day is unique. 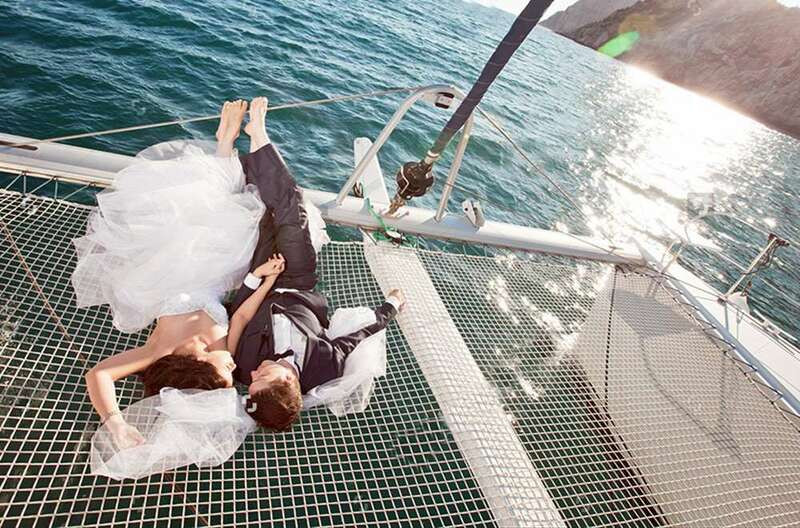 Take one of these unforgettable cruises following your ceremony on the beach. 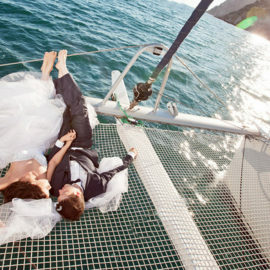 Your private charter can be tailored to your specifications for your most memorable day! Enjoy a wonderful day out on a modern and fully equipped catamaran, EVDORA. 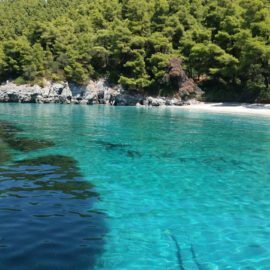 Your crew, Captain George and Crew will offer you an enjoyable day sailing to the delightful neighbouring island of Skopelos. The trip will take you to hidden bays surrounded by the deep blue Aegean Sea. Stops for swimming and snorkelling as well as pure relaxation on deck that will ease your body and soul. If you want to try your hand at sailing you are welcome to support our crew who will be more than willing to let you lend a hand. Enjoy a beautiful lunch in Elios Port on Skopelos island. Come and join us on one of our daily cruises, we will endeavour to make your holiday unique and unforgettable. Sailing on a catamaran is smooth and suitable for all ages, including young children. ..we promise you an unforgettable experience ! The catamaran is a nice boat to be on, with plenty of space to relax on. we booked one evening when the boat was in the port and were allowed to have a look on board the boat before we booked our trip. Friendly captain and crew provide a nice and fun atmosphere all day. Took us to some beautiful beaches, especially the ones on skopelos. Great spots for jumping off the boat and having a swim, and some good snorkelling spots too. Lunch on skopelos was fantastic as well (I had the calamari which was great) Free wine and bottled water on board all day was a nice bonus, especially the water which you definitely need when you're out in the sun all day. We even saw a pod of dolphins which was amazing and we followed them around for as long as we could before they disappeared. All in all a really great day, 50 euros each, plus another 10 each for lunch is well worth it for. My husband and I had a fantastic day out with Captain George on the Evdora catamaran. We visited a small, beautiful beach on Skopelos and then headed to a taverna on the island for a 10 euro lunch which was incredibly good value (George has negotiated a deal with the restaurant). 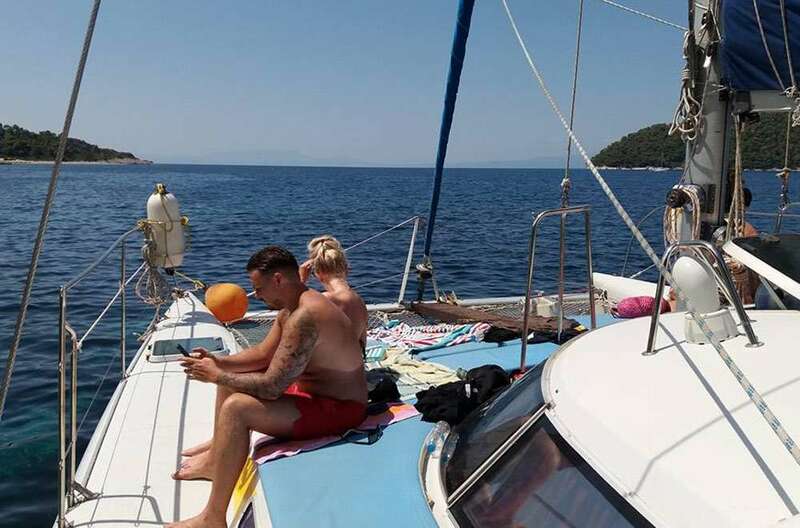 We then visited another beach on Skiathos but most of the time was spent just sailing, which was very relaxing, especially with the jazzy music playing. A great day out and good value at 50 euros each! Water and wine are also provided free of charge. Evdora Catamaran is an amazing boat , with lots of space, and Goerge made us fell great !! Previous review sums our day up perfectly; including the comment on the music! Captain George and his crew were perfect hosts and managed to work around the rain we had for a while. There were 14 of us but never felt cramped. 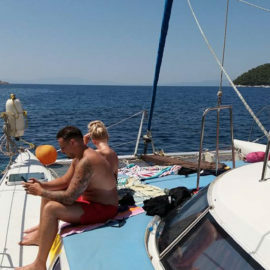 My wife was on the netting for the sail back from Skopelos and was in fits of laughter as waves crashed over her and our friend; a rollercoaster ride without the predictability. Word of warning, sit back against the bouy and hold on tight, you'll find out why! €45 is excellent value for a days entertainment and we had the €10 meal too which was very good. Fishing in the beautiful Aegean Sea! Hello from Captain George ! Our Trip today !! Sailing with the dolphins !! !